We sell A. Vogel (Bioforce) products like A. Vogel Herbamare ® Original 125g online in the UK and directly from our award-winning store in Scotland. Sea salt infused with certified organic herbs and vegetables. Herbamare ® is made from sea salt and 12 different fresh organically grown vegetables, garden herbs and iodine rich kelp. It is a delicious accompaniment to any meal. Houmous is packed full of essential nutrients like zinc, selenium and calcium as well as being a great source of healthy fats from the olive oil and tahini. Ready-made houmous makes a really handy snack, and it’s easy to make at home too! This recipe contains Generous pinch (or more) of Herbamare® Original seasoning. Try this delicious gluten free buckwheat & coconut bread from A. Vogel toasted or served with (dairy free) cream cheese. This recipe contains 1/2 tsp sea salt (you could use Herbamare® ). This pasta dish uses green ingredients, like spinach pasta, basil tofu and garden peas. You can also use purslane instead of rocket leaves! This recipe contains Herbamare to season. If you fancy adding a little bit of luxury to your breakfast or evening meal then this cream gourmet omelette is worth a try. This recipe contains Herbamare to season. Millet sausage are a great alternative to meat. Have them between a soft bun or on their own and serve with lots of salad. This recipe contains Herbamare® Original 125g. We sell real A. Vogel (Bioforce) and other Salts & Nutritional Yeast directly from our shop in Scotland and online throughout the UK. Where can you buy real Herbamare ® Original 125g safely online? If you are wondering where you can buy A. Vogel Herbamare ® Original 125g safely online in the UK, then shop with us. We are an actual health foods shop; with real people selling real foods and products. Our award-winning independent shop is located in Stirling, Scotland since 1976. You can buy our Salts & Nutritional Yeast in store or safely place an order with us online or over the phone. 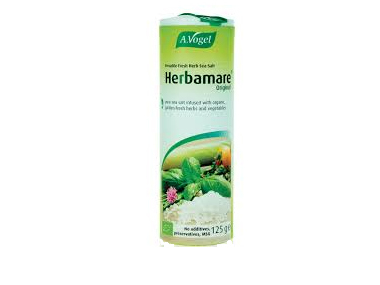 Herbamare ® Original 125g - A. Vogel Herbamare ® Original 125g in Salts & Nutritional Yeast and Herbs, Spices & Salt.